What Is VA Form 21-22a? VA Form 21-22a, Appointment of Individual as Claimant's Representative, is an official form used by the Department of Veteran Affairs (VA) in order to select a veteran's representative to claim VA benefits. This form will allow the VA to identify a representative and have their contact information on file. 21-22a Form may be confused with a VA Form 21-22, Appointment of Veterans Service Organization as Claimant's Representative. VA Form 21-22 is used when a veteran wants a Service Organization to represent them and VA Form 21-22a allows to select an attorney to represent the claimant. Form 21-22a is used by accredited attorneys, accredited agents, private individuals, or service organization representatives who assist claimants in the preparation, presentation, and prosecution of claims for VA benefits. The form contains two pages with instructions in the fields. The individual named on this form should be copied on all correspondence issued by the VA regarding the claimant. VA Form 21-22a fillable version is available for digital filing and download below. 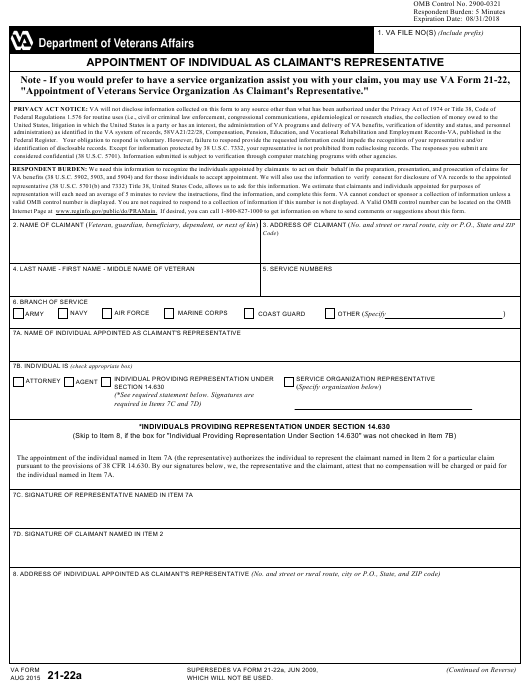 "Appointment of Veterans Service Organization As Claimant's Representative." considered confidential (38 U.S.C. 5701). Information submitted is subject to verification through computer matching programs with other agencies. Internet Page at www.reginfo.gov/public/do/PRAMain. If desired, you can call 1-800-827-1000 to get information on where to send comments or suggestions about this form. the individual named in Item 7A. 9. AUTHORIZATION FOR REPRESENTATIVE'S ACCESS TO RECORDS PROTECTED BY SECTION 7332, TITLE 38, U.S.C. abuse, alcoholism or alcohol abuse, infection with the human immunodeficiency virus (HIV), or sickle cell anemia. in Item 7A, either by explicit revocation or the appointment of another representative. Unless I check the box below, I do not authorize the individual named in Item 7A to act on my behalf to change my address in my VA records. Signed and accepted subject to the foregoing conditions. connection with a proceeding before the Department of Veterans Affairs with respect to benefits under laws administered by the Department. A representative has the authority to review information in the claimant's folder. If the representative holds Power of Attorney (or POA) for only one claim, they may review the information in the file pertaining only to that claim, unless the claimant specifically consents or authorizes the release of other information. The release of claimant's information will not occur without a completed 21-22a Form. If VA Form 21-22a is not signed by the claimant, a representative is not eligible to review the claims file or receive any correspondence from VA including development letters, decision letters, or copies thereof. - when it received a signed statement from the claimant authorizing VA to provide a copy of their folder to the attorney representing them. How to Fill out VA Form 21-22a? The form is fairly straightforward and shouldn't take more than 5 minutes to complete. Getting all the necessary signatures in the appropriate fields is essential. The claimant and the representative each sign on every page. Most of the other fields are self-explanatory. An important moment that can be easily overlooked is that there is a hidden field with no number on it on the second page in the section called "Conditions of Appointment." The small print should be readable. In the space that follows, a claimant can list all non-accredited team members who may call the VA regarding the status of their claim. The form should be submitted as Intent to File a Claim box or as a Fully Developed Claim. It should also be included with any other correspondence, particularly when the third party is the individual signing the correspondence. Box 10 is to place any limitations on the information a claimant does not want to share. If the representative is an attorney or an agent, any limitations on the representation has to be listed in Box 15. Sign and date the form at the bottom. Where to Send VA Form 21-22a? Send the form to a local VA Office or present it in person.